Gallia Academy centerfielder Makenzie Barr tracks down a flyball during the Blue Angels loss to Portsmouth on April 21, in Centenary. 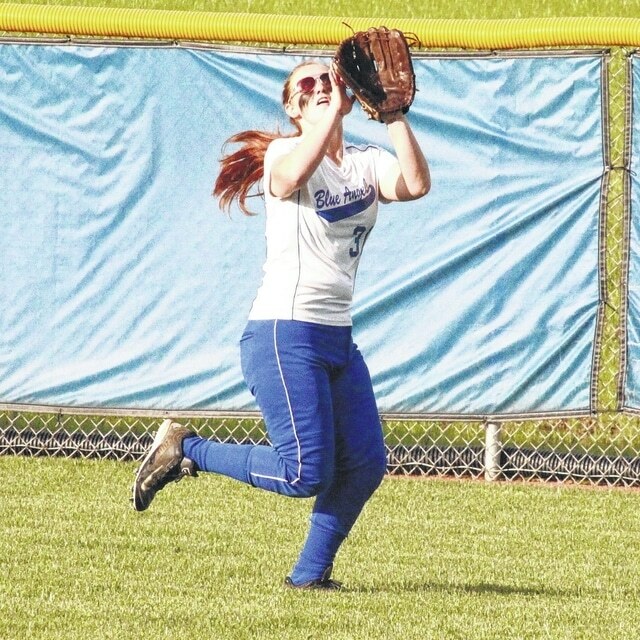 Three ladies from the Ohio Valley Publishing area were selected to the 2015 All-Southeast Ohio District softball teams in Division II, as voted on by coaches in the southeast portion of the Buckeye State. Gallia Academy junior Makenzie Barr was a first team choice on the Division II squad, while senior Kendra Barnes and sophomore Jenna Meadows were D-2 honorable mention selections for the Blue Angels. Brooke Blevins of Unioto was named the D-2 southeast district player of the year, while Brad Jadwin of Unioto was selected as the D-2 coach of the year in the southeast district. Brooke Blevins, Unioto; Darbi Brewer, Circleville; Kacee Jenkins, Jackson; Kerstin Thornburgh, Hillsboro; Ashley Grow, Waverly; Maddy Conrad, Logan Elm; Wendy Hawk, Washington CourtHouse; Tosha Fox, Miami Trace; Alexis Woodside, Fairfield Union; Sam Humphreys, Jackson; Gabby Johnson, Sheridan; Haylee Jo Large, Chillicothe; Hannah Breeden, Hillsboro; Emily Ward, Unioto; Makenzie Barr, Gallia Academy; Arri Shcetter, Warren; Ashley Burton, Waverly; Michaela Criner, Fairfield Union. Olivia Hoon, Athens; Bri Dawes, Chillicothe; Cayla Allen, Vinton; Maggie Johnson, Circleville; Mayci Marshall, Logan Elm; Alison Dickerson, New Lexington; Maddy Towbridge, Sheridan; Whitney Cockerill, Miami Trace; Taylor Barrett, Miami Trace; Allie Wood, Logan Elm; Tatum Brown, New Lexington; Gabby Cooper, Washington CourtHouse; Brooksana Barnet, Vinton CO; AJ Knul, Circleville; Jamie Fraley, Sheridan; Kaylee Higgins, Warren; Mariah Ridgeway, Jackson; Haley Woodbridge, Chilicothe. Destiny Alderman, Logan Elm; Kat Kroutel, Athens; Maki William, Waverly; Kourtney Ison, Waverly; Destyn Beard, New Lexington; Bailey Harris, New Lexington; Jordan Banks, Jackson; Madison Snyder, Hillsboro; Ali Stratton, Hillsboro; Kate Jude, Washington CourtHouse; Liv Johnson, Sheridan; Shalynn Reffitt, Vinton CO; Darian Radabaugh, Vinton CO; Kendra Barnes, Gallia Academy; Jenna Meadows, Gallia Academy; Jordan Pierce, Unioto; Kirklyn Rossiter, Fairfield Union; Alexis Eaton, Fairfield Union.